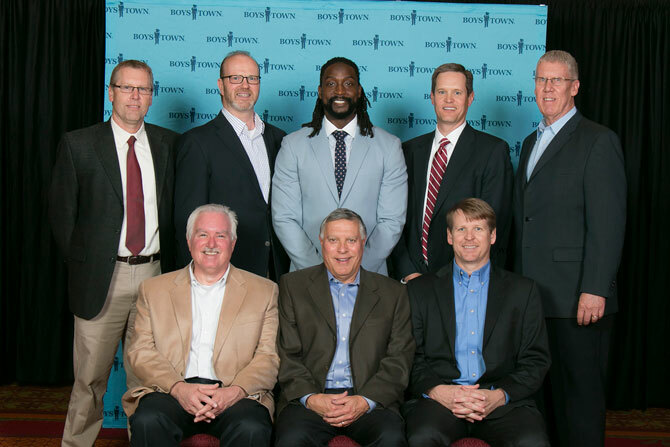 The annual Boys Town Booster Banquet was held on Tuesday, May 3rd, 2016 at the La Vista Conference Center, which raises money for athletic programs at Boys Town. Schemmer’s Darin Brown, Steve Kathol, Charly Huddleston and Shane Swope attended as well as their guests Bill Herr, Neil Smith and Bob Ford. The banquet included a live and silent auction, raffle drawings, dinner, student athlete recognition awards and keynote speaker Charles “Peanut” Tillman, 13-year NFL veteran and two-time Pro Bowl selection. Tillman and his wife Jackie, founded The Charles Tillman Cornerstone Foundation, which provides opportunities and resources to children and families in need. Kathol, a Booster since 2006, enjoys his involvement and support of this organization because it provides resources for kids to have an opportunity to be part of team and develop a feeling of accomplishment and purpose, while learning valuable life lessons along the way. The Boosters are made up of Omaha Business Leaders who meet throughout the year to plan the event and sell tickets to the banquet. Their primary goal is to raise money to ensure proper equipment, uniforms and other necessities are available to enable any child who wants to play sports can do so.